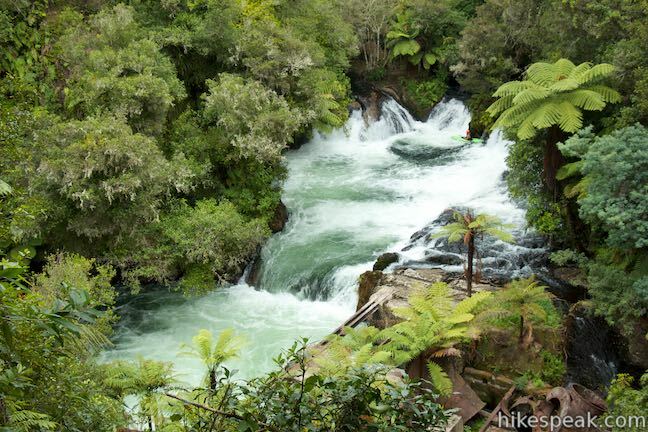 Okere Falls Track presents a 3-kilometer round trip walk (1.9-mile hike) in Okere Falls Scenic Reserve near Rotorua, New Zealand loaded with views of waterfalls, cascades, and emerald-colored pools on the Okere River, all encircled by dense native brush. 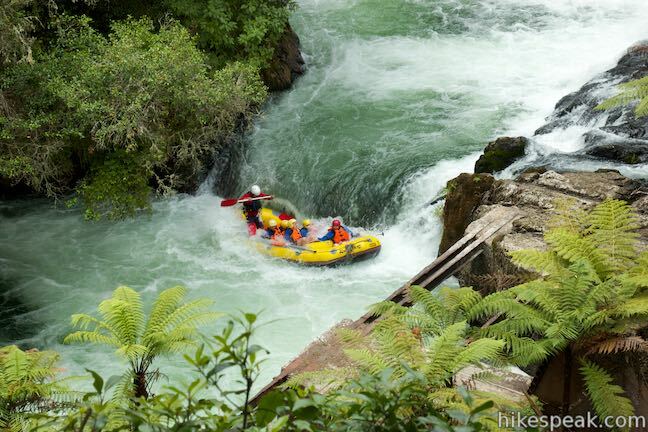 The river can be explored on an exciting whitewater rafting trip, but you’ll get a great overview of its finer features and stay dry on this short walk, which is full of beauty and history. 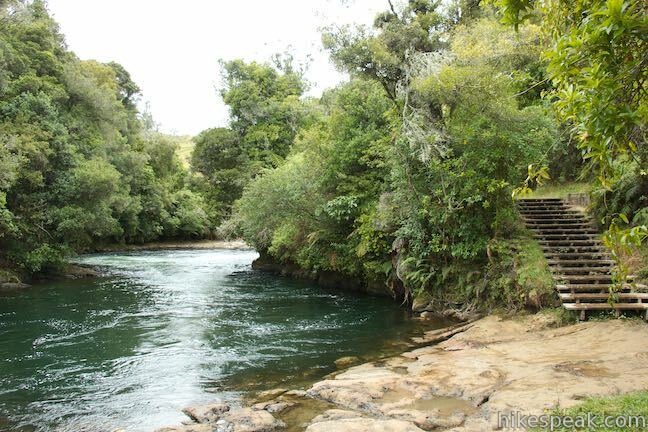 Significant Māori and European historical sites are contained in this reserve, including the remains of the fourth hydroelectric power station even built in New Zealand. 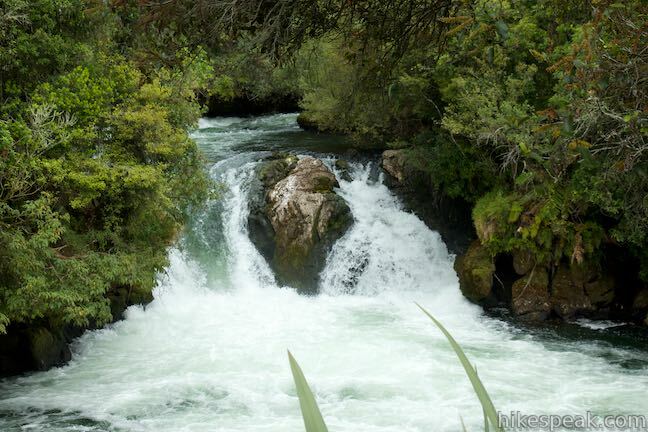 The Okere River descends through the reserve, tumbling over four waterfalls and through regeneration native bush before opening out to the Okere Trout Pools. 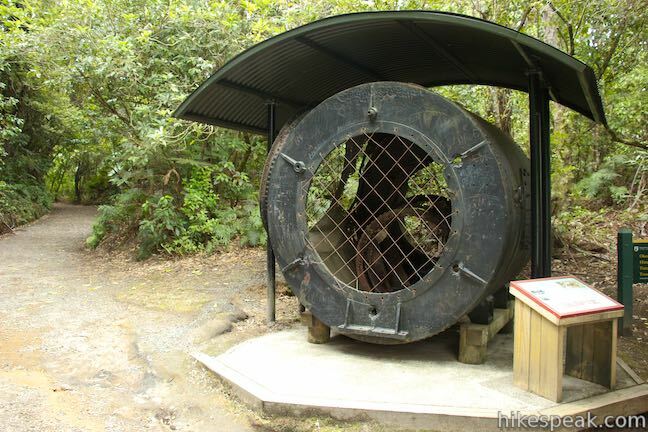 This turbine was retrieved from the remains of the dynamo or power house which formed part of the Okere Falls Power Station on the Kaituna River. It was one of two Waverley Horizontal turbines originally installed in the dynamo house. These turbines were water driven and connected to two 50 kilowatt generators, enabling 100 kilowatt output. The turbines were brought to the site by bullock team in 1900. They were lowered to the dynamo house on the river through the excavating cutting behind you. In September 1995, the turbine was hauled from the riverbank through the same cutting to prevent its further deterioration. Go past the turbine to get a view of the old power station along the Okere River. 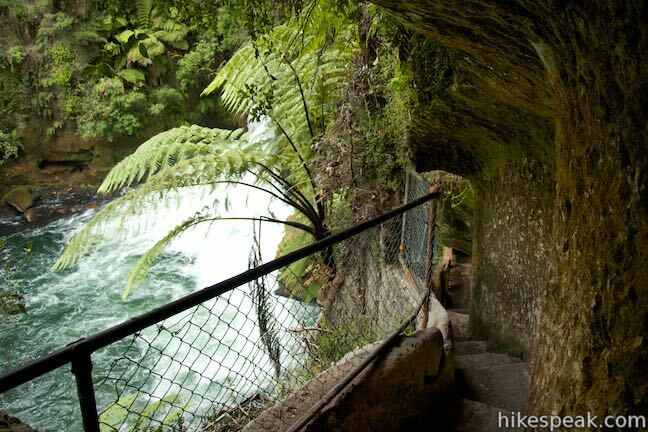 After walking 75 meters up the track to this first junction, turn right, following signs for Okere Falls and power house viewing. 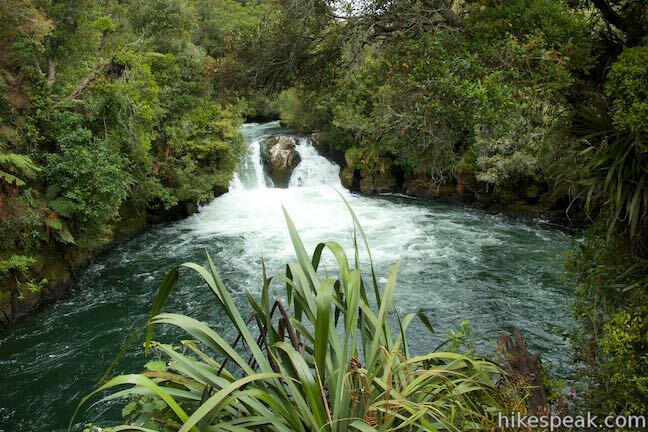 Walk 25 meters down to a grand view of Okere Falls and a string of cascades. 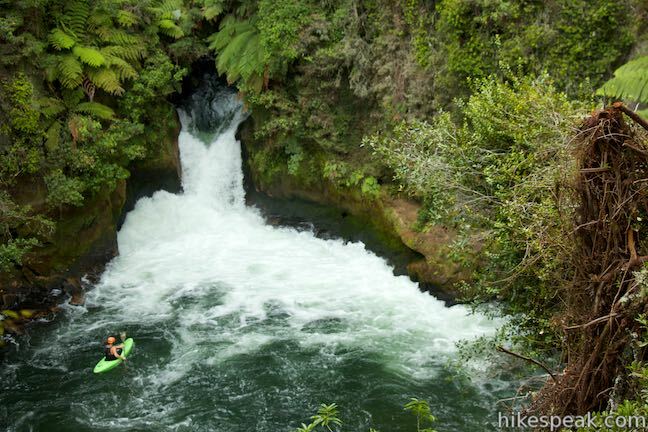 Emerald pools on Okere River are surrounded by dark green rainforest-covered cliffs. Below the waterfall, on the side of the river below the overlook, you’ll see the ruins of Okere Falls Power Station, where a mix of concrete and rusting metal is being overtaken by nature. To get an idea how the river looked during the early years of the twentieth century, imagine a long flume carrying water from the top of the falls to a spot above the power station where the water would fall over large blades to spin turbines and generate electricity. 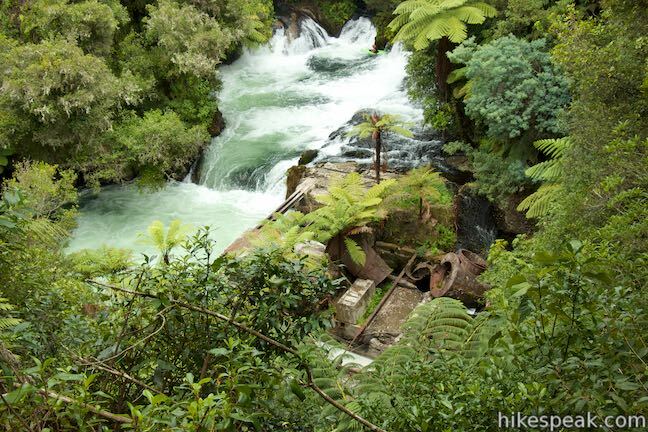 The flume is long gone, allowing for unobscured view of Okere Falls, which is a short, wide waterfall that emerges from the rainforest in channels broken up by rock islands. Watch rafts and kayaks cross over the falls on a wet and wild ride through Okere Falls Scenic Reserve. Backtrack from Power Station Lookout up to the main track and turn right to continue on Okere Falls Track. 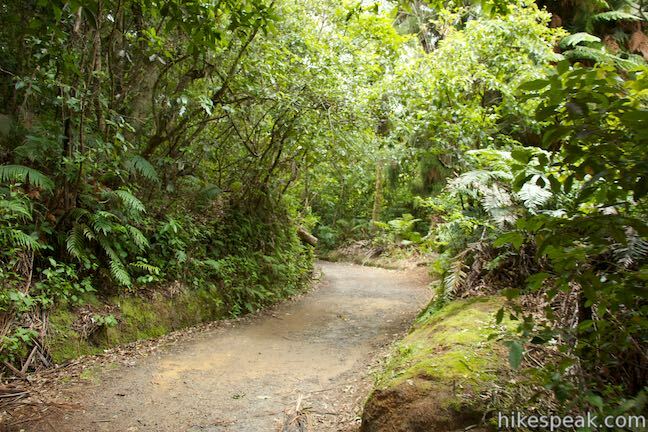 The wide and well-maintained track passes through lush, dense forest on the cliffs above the river. 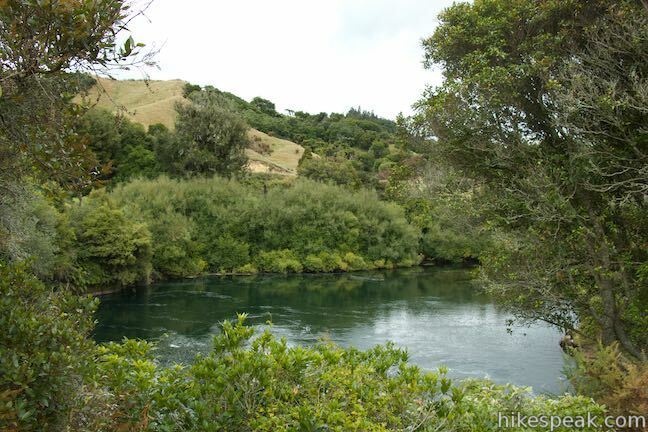 After walking a total of 550 meters, come to another junction and turn right, following a sign for Tutea Falls and Hinemoa’s Steps to Tutea’s Cave. 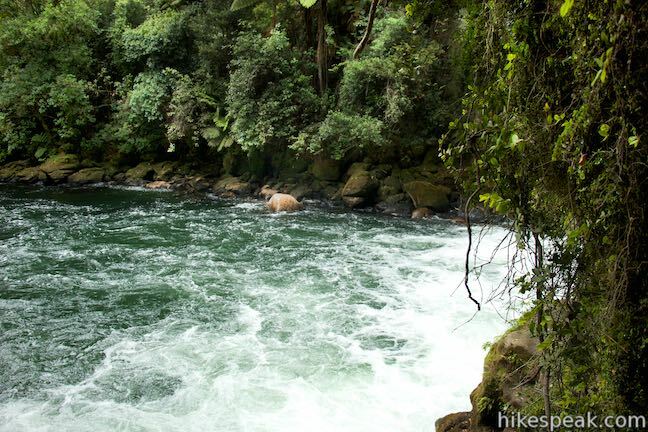 Walk fifty meters out on this spur, taking wooden steps down to an overlook that faces upstream toward Tutea Falls. 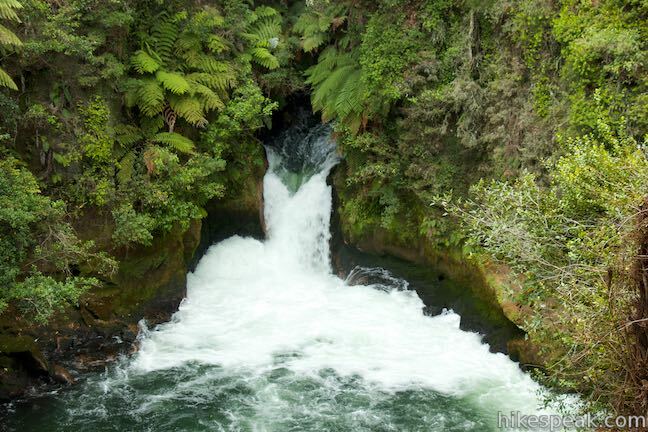 This beautiful waterfall is framed by rock walls that push the water down a chute. Tutea Falls measures 7 meters (23 feet) tall, splashing down in a frothy mix of spray above a green pool. 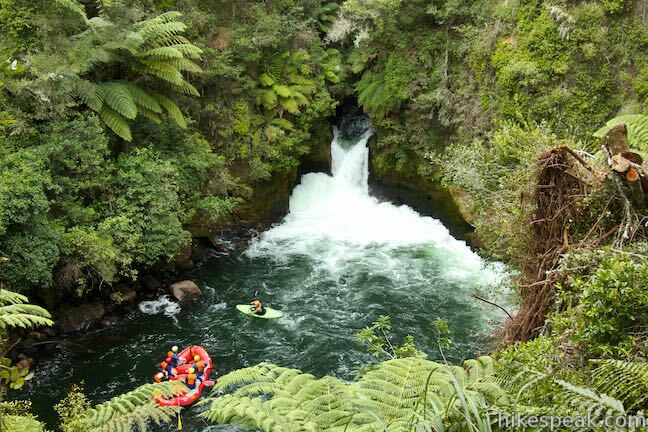 If you think Tutea Falls looks too tall for whitewater rafting, you’re almost right. 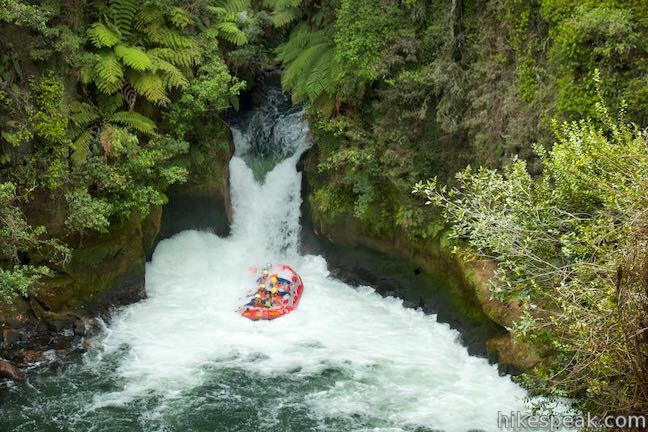 Tutea Falls is the tallest commercially rafter waterfall in the world. 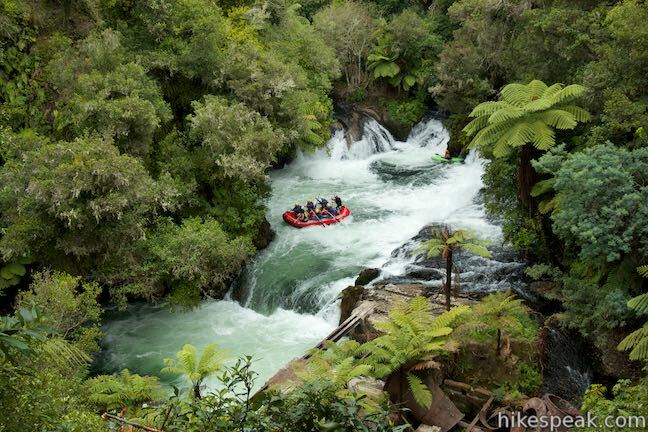 It’s a thrill to go over in a raft, and can can get a taste of the excitement watching rafts tip over the brink, turn vertical, and plunge into the spray below the falls, sometimes disappearing completely from view before popping back up. 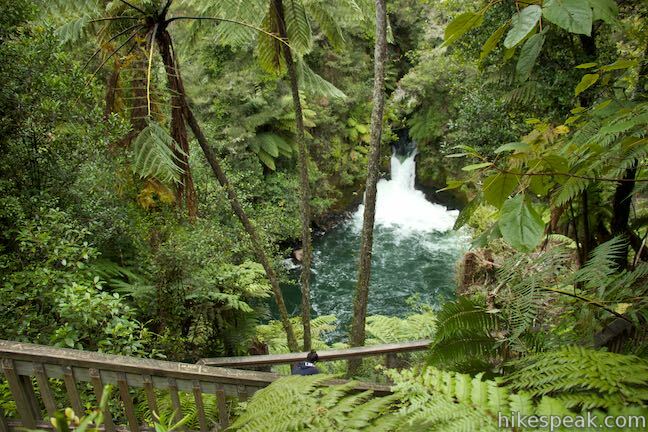 The lookout provides an excellent vantage of the waterfall, and there is even more to see. 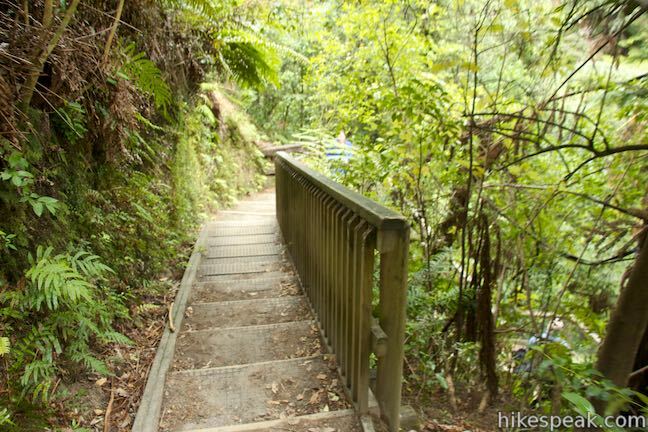 Continue down switchbacks in the trail below the lookout to get down the bluff to Hinemoa’s Steps. 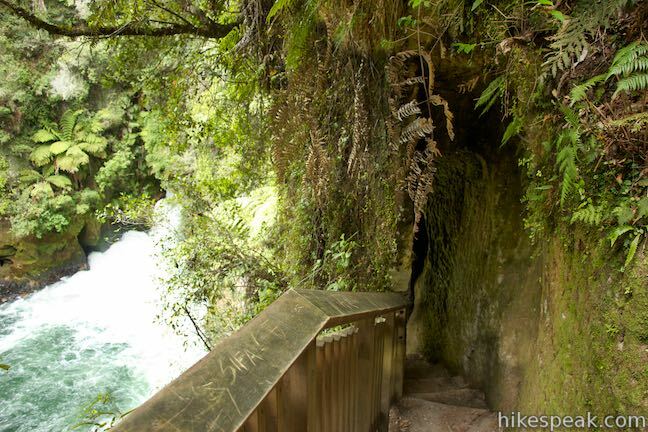 The steps were cut into the cliffs along the river to access Tutea’s Cave, which recedes into the rock face above the river just below the waterfall. 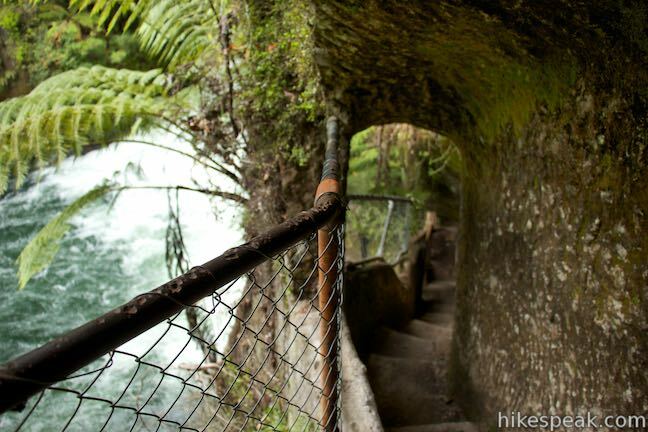 Engineers from the power station carved out the steps in 1907 so that tourists could get to the cave. 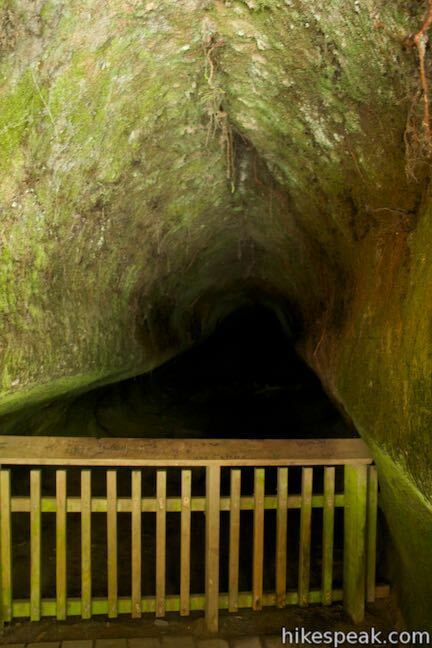 After descending through an archway in the impressive staircase, get an almost river-level view across the churning water. 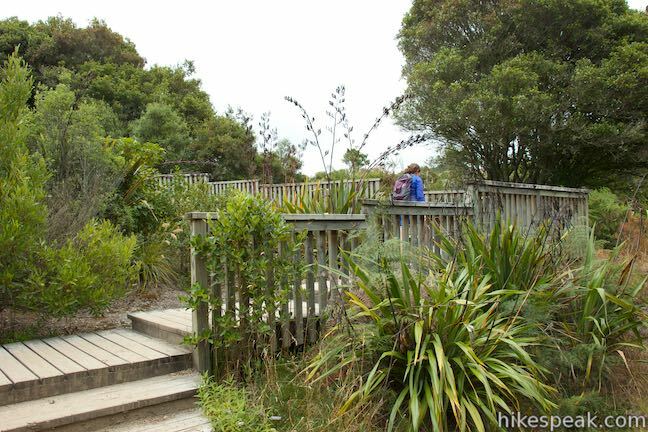 The steps are named after a folkloric Māori woman, Hinemoa. 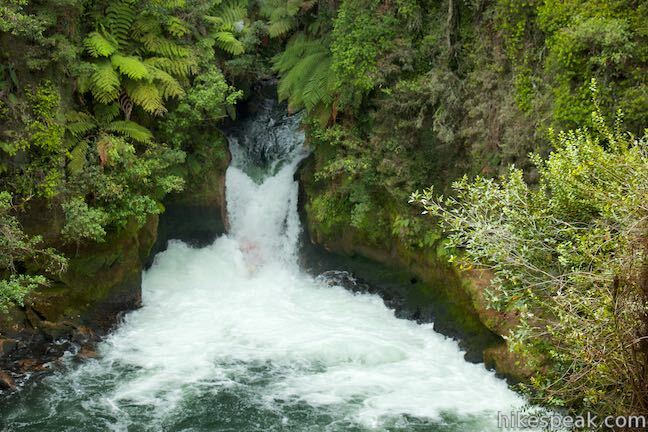 According to the legend Hinemoa was a chief’s daughter who swam across Lake Rotorua to be with her forbidden love, Tutanekai. 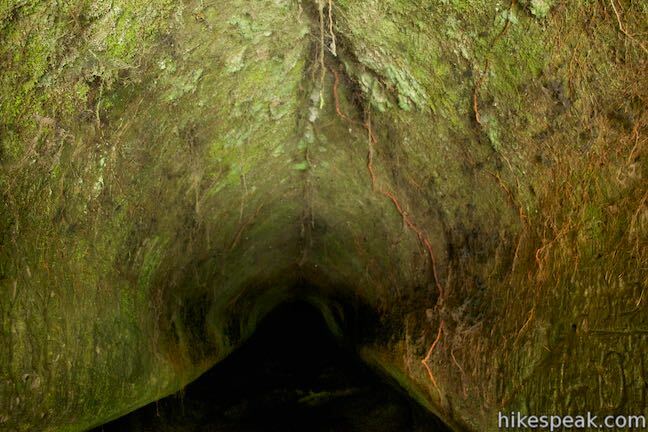 Some sources suggest women and children may have hidden in the caves in times of war, making the treacherous descent by rope. 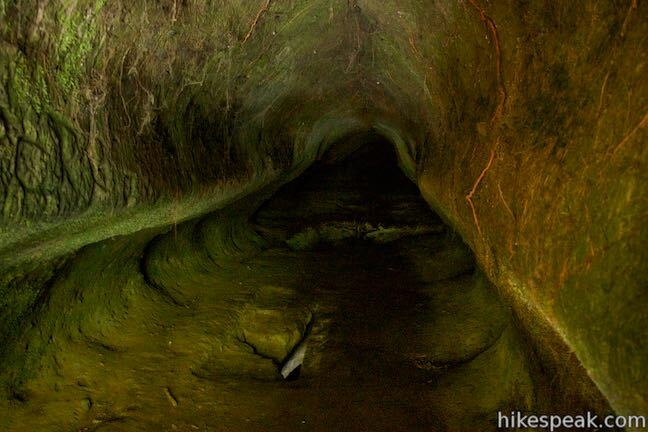 Nowadays the occupants are occasional cave wetas. You can take the stairs back up to the overlook (no need to rely on perilous ropes to get back up the cliffs from the cave). 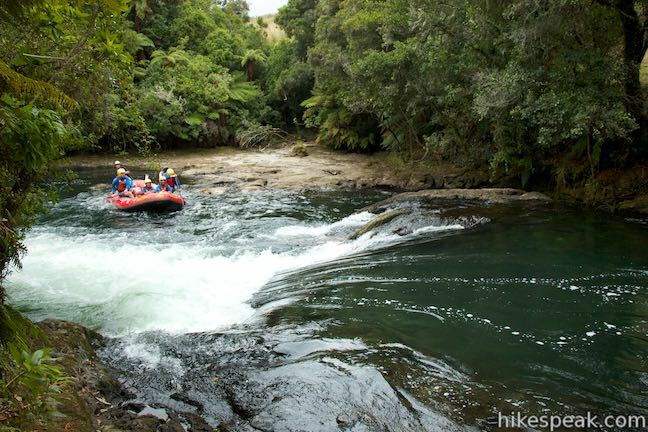 Retrace your steps to the main trail and turn right to continue heading downstream. 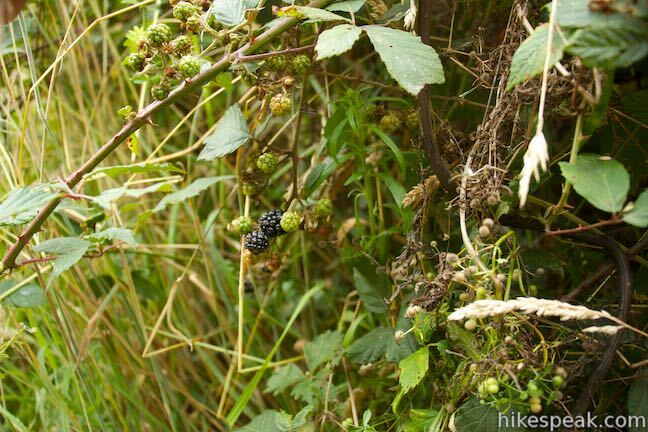 The track goes gradually downhill through the rainforest, passing patches of blackberries in season. After 1.5 kilometers of hiking, come to a third junction. A fifty-meter long track to the left goes to the car park at the end of Trout Pool Road. 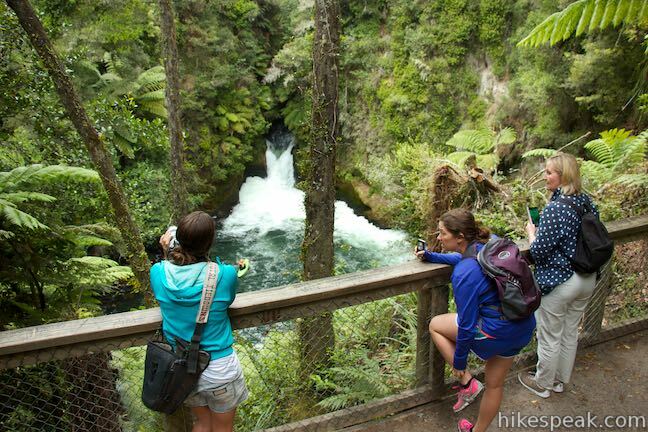 Bear right to proceed with Okere Falls Track to two more lookouts and views of Trout Pool Falls and Trout Pool. You will return to this junction after walking another 500 meters on a loop. Excluding the side tracks to the waterfall overlooks, it is one kilometer back to the starting point from this junction. 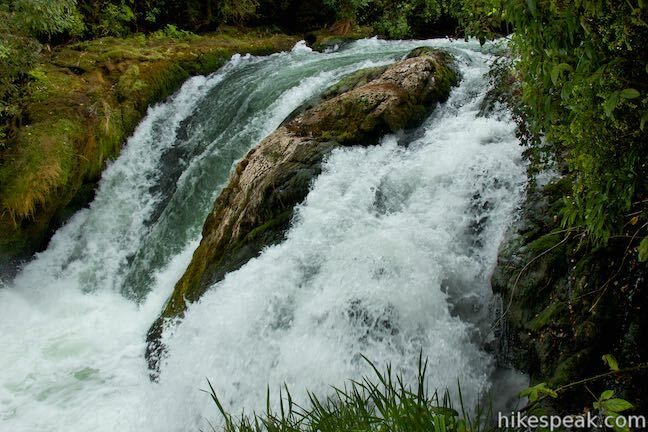 Walk a hundred meters farther to a wooden viewing platform above smaller rapids on Okere River. You can descend to the river’s edge to the left and right. 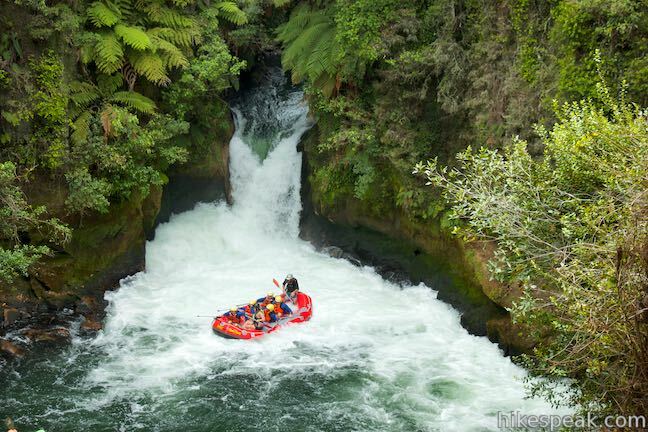 To the left, a flight of steps leads down to the take-out point for rafts making the adventure down the river. 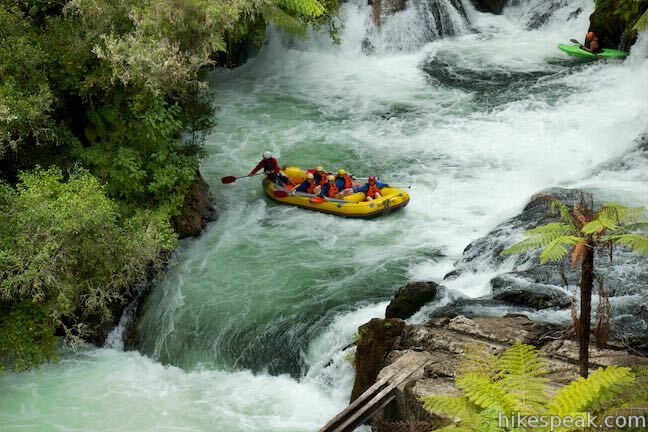 If you’re wondering why they get out here, it’s because Trout Pool Falls is just downriver and that class 6 drop is too dangerous for the commercial rafting outfitters. 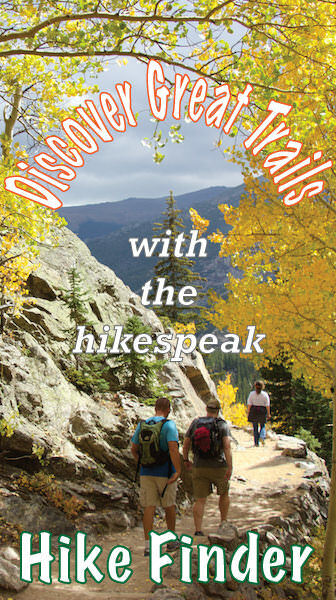 Proceed on the track along the river to see Trout Pool Falls. 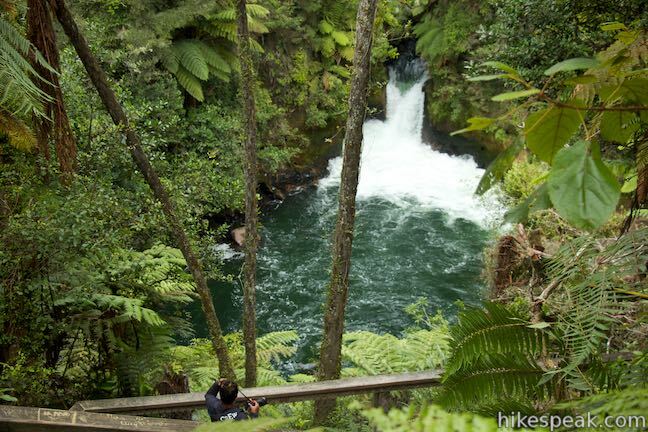 Footpaths off the track lead to views alongside the waterfall, and you can get a head-on view of Trout Pool Falls from farther down Okere Falls Track. The track goes along cliffs above Trout Pool, where the river widens. 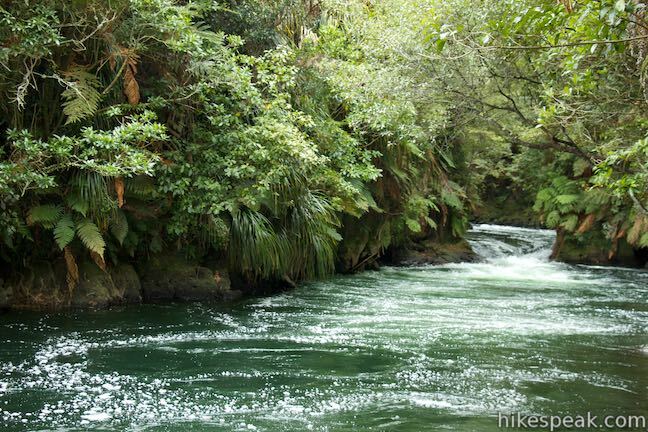 The pool is a popular fishing spot, where trout may be visible swimming upstream against the current. 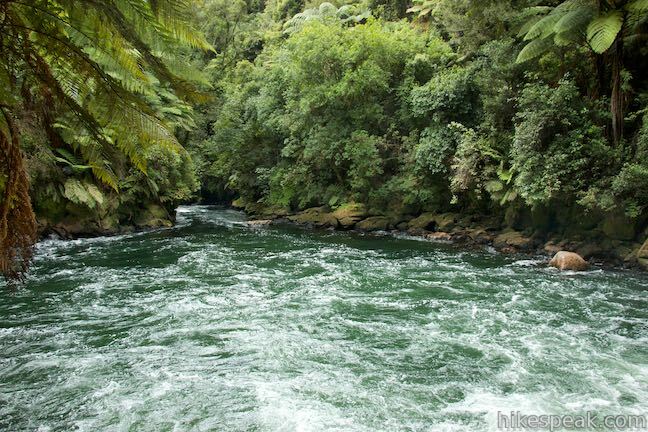 Another name for Okere River is Kaituna, which translates to eel food. 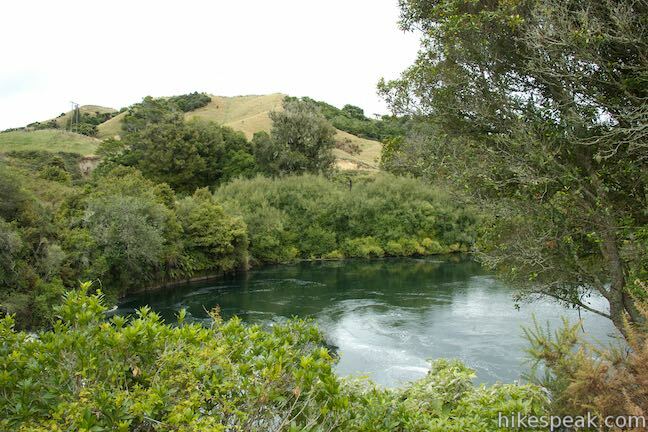 Eels were a significant food source for the Ngāti Pikiao who lived here. 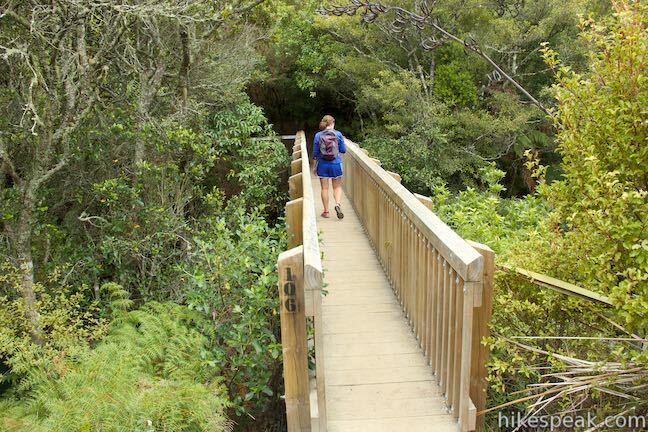 A wooden footbridge crosses the river above Trout Pool to connect to a hiking track on the opposite side of the river. Skipping that extension, the track continues up steps to a viewpoint above Trout Pool. Curve to the left to get to the car park on Trout Pool Road. 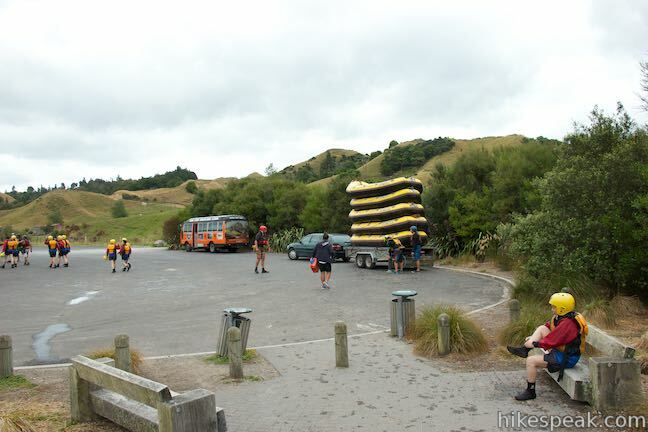 This is an alternate starting point for hikers, mostly used by rafting companies to load up after the adventures down the river. 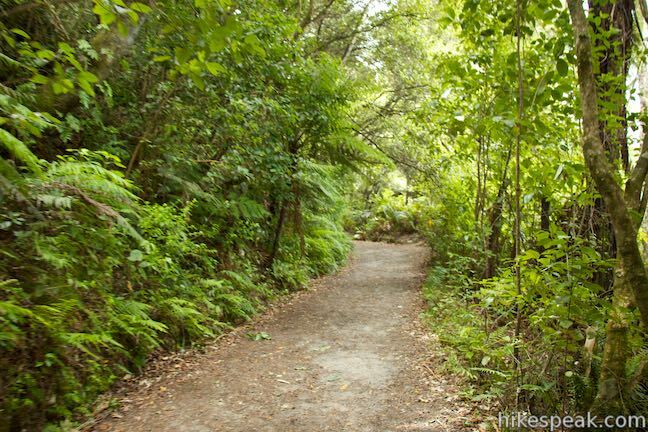 Take the track heading east from the car park back toward the river and you will quickly complete the loop. 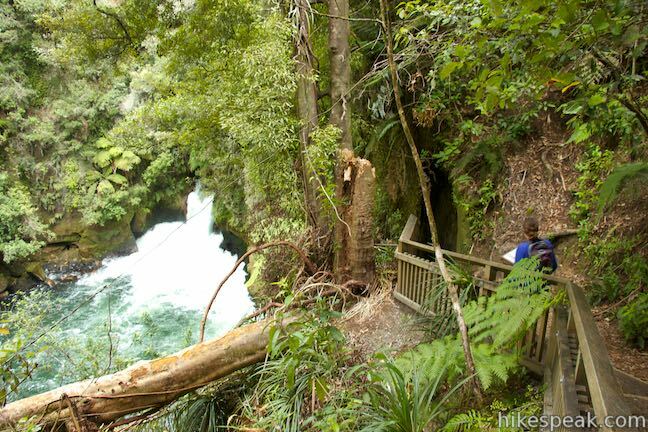 Turn right up Okere Falls Track to walk one kilometer back to the start (unless you decide to revisit the overlook). 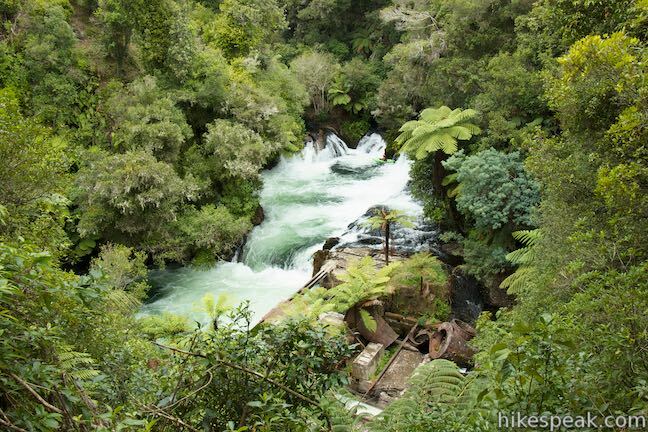 Okere Falls Track has interesting history and impressive scenery. 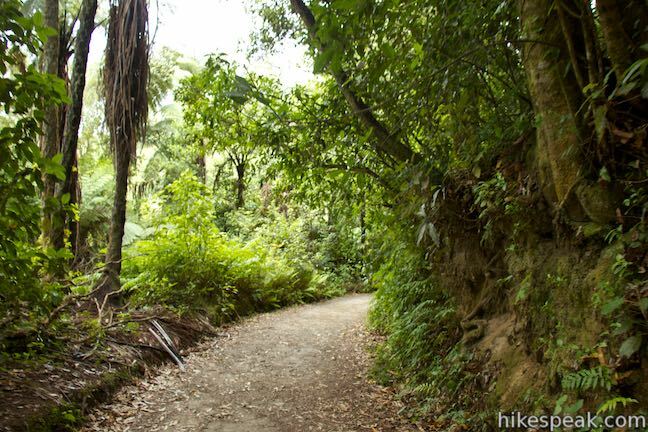 There is 55 meters (180 feet) of elevation change on this relatively easy 3-kilometer walk with steps. 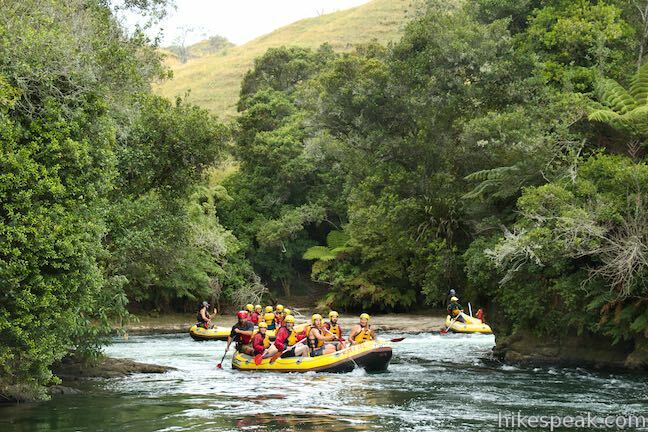 The river it overlooks is a massive adventure on a raft and the trail is exciting too. 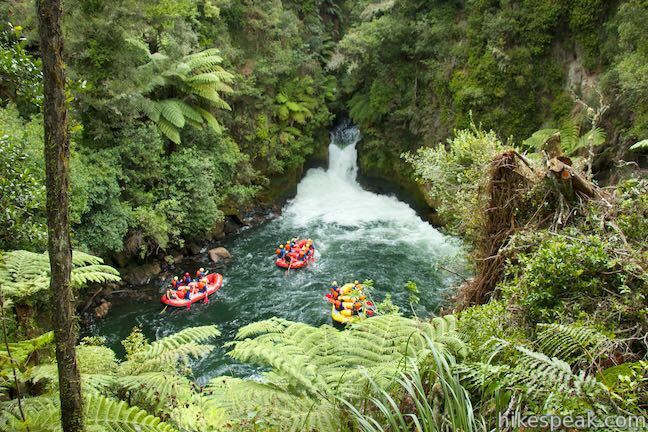 If you’re inspired to get in on the rafting fun, consider whitewater rafting with Kaitiaki Adventures. 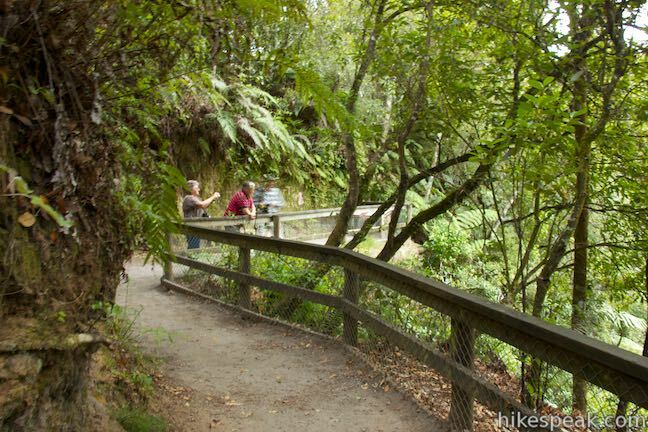 Dogs and bikes are not allowed in Okere Falls Scenic Reserve. 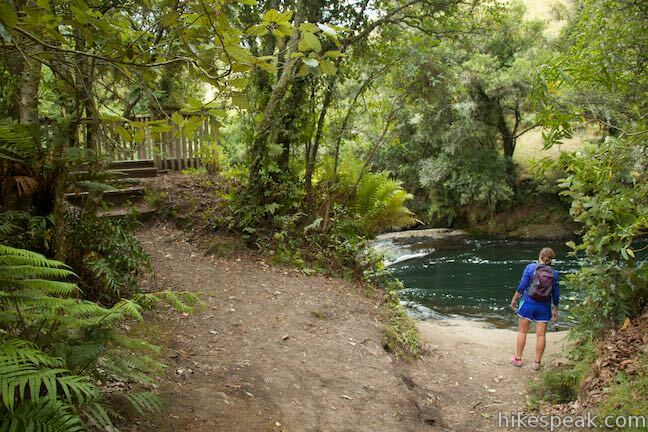 There is a toilet near the car park by the south end of the track Okere Falls Scenic Reserve is free to visit and no permit is required for Okere Falls Track, so get out and enjoy! 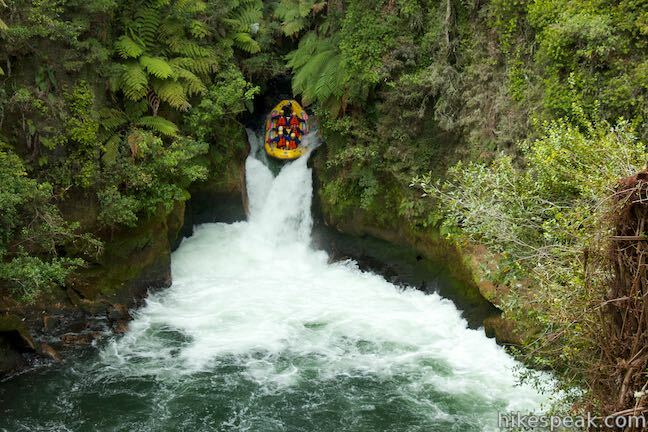 Directions: From the center of Rotorua, take State Highway 30A east from State Highway 5 for a few kilometers. The road joins State Highway 30 and proceeds north. Drive 10.4 kilometers and go straight onto State Highway 33 as SH 30 turns to the right. 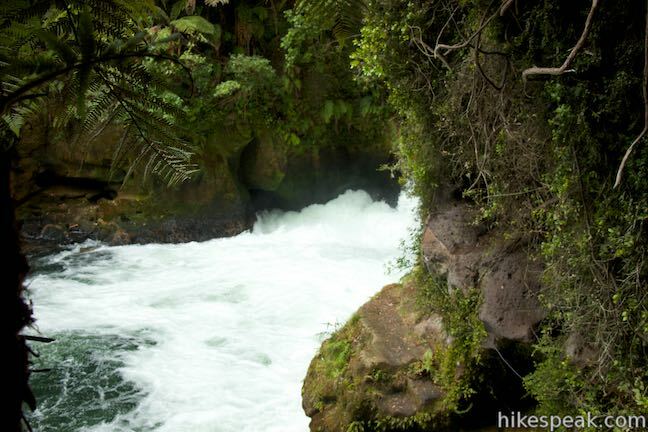 Drive 7.8 kilometers to the outlet of Lake Rotoiti and turn left onto Trout Pool Road, following a sign for Okere Falls. Drive 350 meters and turn right into a large car park at the start of the walk. 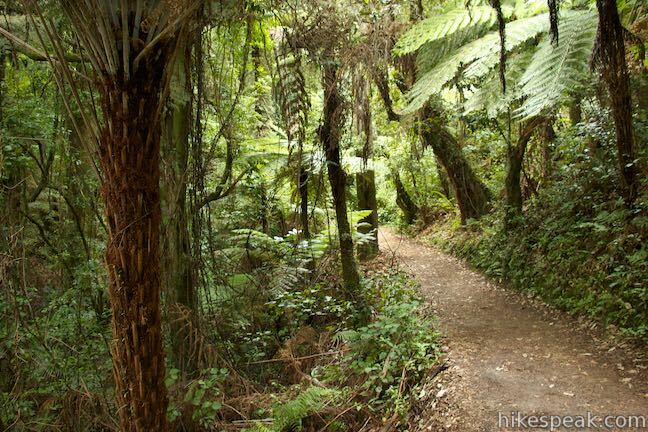 This 6.8 kilometer trek combines picturesque tracks around the base and up to the summit of a 232-meter tall mountain on the tip of a peninsula in the Bay of Plenty Region of New Zealand.